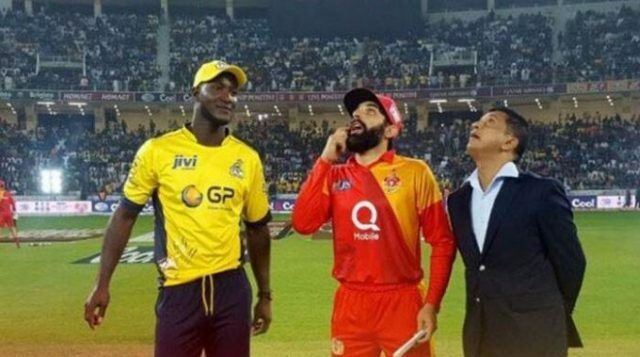 Defending champions Peshawar Zalmi will hope to carry a winning momentum against Islamabad United in the final of the Pakistan Super League as cricket of some international colour returns in Karachi after a big gap of nine years on Sunday. Peshawar won the last two matches of the league phase to sneak into the playoffs and then beat Quetta Gladiators and Karachi Kings in the two eliminators to earn another shot at the defence of the title they won in Lahore last year. Islamabad, who won the title in the inaugural year of the PSL in 2016, is likely to be without their inspiration skipper Misbah-ul-Haq who suffered a hairline fracture in his left wrist, which left the captaincy in the hands of experienced South African batsman Jean-Paul Duminy. For the overseas players, the focus has been unprecedented in and around the team hotel and the National Stadium which will be cordoned off by around 10,000 military and police personnel with spectators body searched and carried to the stadium in shuttles. Duminy was part of the South African one-day squad which played in Pakistan in 2007 and on his second visit he felt more passionate. “It’s amazing to see how semi-finals went down in Lahore, the passion behind the game and support for local teams so we are very excited about tomorrow, it’s obviously going to be an exciting occasion to be part of PSL final and more specifically being in Karachi, so we are very excited about it,” said Duminy. Peshawar Zalmi skipper Darren Sammy also described the final as a great occasion. “Look there is no secret that I am not 100 percent fit there is no secret about it. I have to take part for my team and tomorrow that’s what I intend to do. The two games in Lahore were eventful ones and the first one especially was not good for the heart. Sammy said his squad is pumped up for the final. “Yes, we are pumped up, we are pumped up for the time they told us that we would not qualify for the playoffs. My team has shown great character and the guys stood up when we needed them. “Look at the start of the tournament I said that we are here to defend our title, we knew that it’s not going to be easy. But the journey has been a great one and we have one more knock out game and Islamabad is in our way, so we have to stop them,” said Sammy. The final is also seen as a contest between two in-form batsmen, Peshawar Zalmi’s Kamran Akmal and Islamabad’s Luke Ronchi. Kamran has notched the highest tally of 424 runs in the tournament while Ronchi has 383. Sammy admitted his team has to stop Ronchi but also warned of danger Kamran can pose for the opponents. “Look, Kamran Akmal is also in red hot form too, so they have to stop him also, We respect our oppositions and so far our bowlers have come up with a plan against the batters and that’s why we are in the final. Both teams also possess strong bowling attacks. Islamabad United have the services of league’s leading with taker in Faheem Ashraf with 17 coupled with the veteran Mohammad Sami has 12 and left-arm spinner Samit Patel has 11. Peshawar’s four-pronged pace attack is more potent with Wahab Riaz (16 wickets), Umaid Asif (12), Hasan Ali (ten) and Sameen Gul (six) all in good knick. So a capacity 33,000 crowd is up for a real Twenty20 treat on a pitch loaded with runs. The newly laid stands will roar for one more time after a big gap and cricket will be the winner on Sunday.